Iranian Army has started big Exercises for 3 days in Persian Gulf from Yesterday. Iranian Army is also known as Pasdaran-e Inqilab. Iranian Army is doing big Exercises at a time when there is lot of Tension Between West and Iran and both are giving Statements after statements against each other. Western Forces are Feared that Iran is trying to Make Nuclear Weapons while Iran is denying this news and saying that our Nuclear program is peaceful. The Basic purpose of Iranian Army Exercises is showing their strength. Persian Gulf is considered a very important path fron Economic and energy point of view where these Exercises are going on. 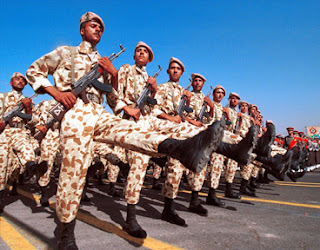 Iranian army has said that these Exercises are not a threat for any Friend Country. Pakistan army has also done biggest Ever Exercises recently on Indian Border. China will support Iran sanctions or not?